Christian communities can experience real, spiritual fruit. Every Christian wrestles with the need for change, and all have hearts that go astray. However, it can be challenging to understand and apply a biblical view of change to our everyday thoughts, feelings, actions, and relationships. God promises to change us to become more like Jesus, but what does that look like? How does this transformation make life and relationships truly beautiful, and how do we have honest discussions about our own struggles in light of how Christ brings comfort, help, and change? 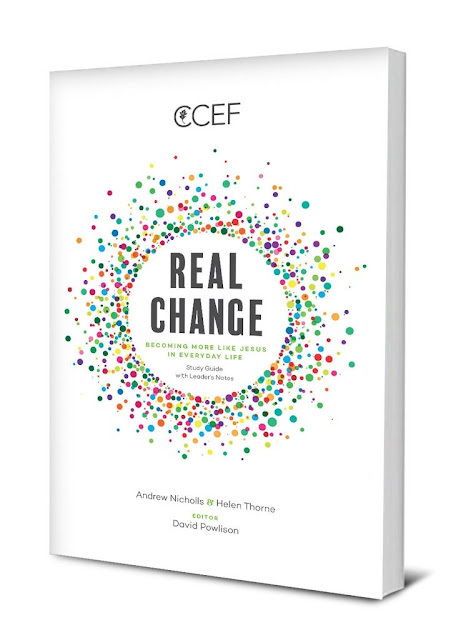 Real Change: Becoming More Like Jesus in Everyday Life (New Growth Press/October 22, 2018), edited by Andrew Nicholls and Helen Throne through the Christian Counseling & Educational Foundation (CCEF), is a six-week, Bible-centered course for church groups and discipleship programs, introducing a simple model for understanding how God changes us to become more like Jesus. Based on the CCEF model of change from David Powlison’s course “Dynamics of Biblical Change,” readers will explore how they can grow to be like Christ in the hardest circumstances through Leader’s notes, Bible study sessions, pointed questions for discussion, and a “self-counseling project” for personal reflection or peer discussion. The course is designed for readers to participate in ninety-minute group sessions and, ideally, an hour of personal study. While the study material is designed for use within small groups, it can be used for one-to-one discipleship study as well. No matter the context in which the course is used, Real Change is a flexible course intended for any individual or group of Christians wanting to become more like Jesus. “We’ve seen leaders get together and help [teams] be accountable to one another and provide a framework for training in pastoral care. And we’ve used it in one-to-one settings as the basis of discussions with someone who is wrestling with personal struggles,” Thorne explains. The process of change is often slow, and the course certainly doesn’t promise dramatic transformation in readers’ lives in six weeks. However, Real Change introduces people to the process of change, and it encourages people to engage in it. Over time, both editors are confident this will produce real, spiritual fruit, which is up to God. New Growth Press publishes gospel-centered Christian books, small group, and children’s Bible resources for discipleship, biblical counseling, and missional ministry. For more information about Real Change: Becoming More Like Jesus in Everyday Life and other releases from New Growth Press, visit www.newgrowthpress.com.